I have been asked this question so many times that I finally decided it was time to write a short article on it. It sounds like a simple question, but when it comes right down to it and you are wondering what to do for your own children, it can be confusing. Some people believe that since multivitamins are a relatively new “invention” and that our bodies have gotten along just fine without them for thousands of years, they are a gimmick. Still others believe that they are an essential element to good health. Here is my take… When it comes to nutrition, I generally fall along the lines of “if it is too far removed from the way it has grown, our bodies were not meant to ingest it.” Certainly, vitamins of any kind are not a substitute for proper nutrition! The truth, however, is that most of us don’t have a perfectly balanced and healthy diet, despite our best intentions. I know we don’t in our family. So, yes, I do give my kids multivitamins, along with other vitamins and supplements as well. They don’t have them on a daily basis, rather, maybe 2-3 times a week, and I have a couple of important criteria for which ones I buy. I also make it a priority, as much as possible, to provide foods that are high in nutrition for my kids and make sure that they eat their fruits and veggies several times a day. In addition, and this is very important, we don’t drink soda and drink juice very seldom. Again, vitamins should not be considered as a substitute for ensuring that your family is getting proper nutrition. They can, however, be a good addition to ensure your child is getting the nutrition they need to grow a healthy body. What Kind of Multivitamin Should I Buy? Never, ever buy vitamins that are artificially sweetened. Artificial sweeteners of any kind are substances our bodies were not made to process, and they are harmful, especially to children who’s bodies are growing rapidly! If your child is old enough to swallow pills, stay away from chewables. They are all sweetened in one way or another; some are just more like candy than others. When your vitamins contain more sugar content than nutrients, I would go without. All that said, most children are not going to eat chewables that taste horrible. It is rather hard to find brands that are not too sugary, but still taste good. We have tried several different kinds over the years from liquid to powder to chewables. The brand that we have used, and like most, are Rainbow Light Multistars. We have also used Nature’s Plus Animal Parade Multi’s, and Vitamin Code Kids (this is one of the cleanest, best formulated multivitamins I have found, but my kids were not huge fans of the flavor). In general, I like to be sure sugar content is below 2 grams per serving. That is just a rule of thumb that I use. Sugar has a detrimental affect on the body’s immune system, and is hidden in so many things you’d never suspect it to be in, so the lower the content the better. One of the most important things to look for in a multivitamin is where they are sourced from. For example, some vitamins are synthetically made, and some are taken from whole food sources. If you want a vitamin that is going to provide optimal nutrition, make sure your vitamin is taken from whole foods. Your body is able to absorb the nutrients in whole foods vitamins much more readily than in vitamins that are derived from synthetic sources. Ideally, you should be able to read the label and see foods that you recognize. Double check the label to see what is being used as a filler. Label reading is so important, whether you are buying food or vitamins. You do not want artificial flavors or colors of any kind in your multivitamin. If your children have food allergies, be sure you know that your formula is free of those things your child is allergic to. Many multis are formulated with this in mind, nowadays, but it is wise to double-check. The Rainbow Light multis that we use are gluten, soy, yeast, milk, egg, nut, fish and shellfish free. Probiotics, digestive enzymes and Omega 3’s are a nice addition to any multivitamin complex. I believe these are so important that I supplement my kids with them in addition to any multis we might do, sometimes with vitamins and sometimes through the foods I give them. These are some of the main things that I look for when buying multivitamins for my children. As I stated before, good overall nutrition is overwhelmingly the most important factor in growing children with healthy bodies, but I do believe that multivitamin supplements can be a good addition to a healthy diet. Oh, and one warning: be cautious to keep the bottle away from younger children who may think they are candy and eat too many at one time. Multivitamins with iron in them can be dangerous to children if consumed in high quantities in one sitting. I’d love to hear your thoughts! 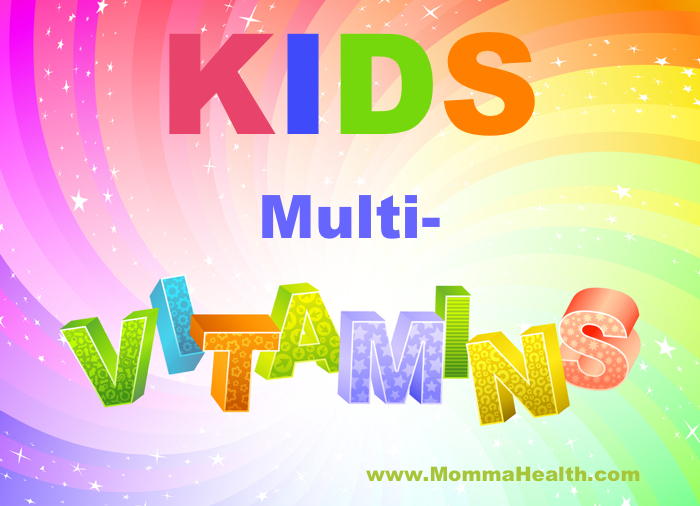 Do you give your children multivitamins? Which formula do you use? What do you look for?